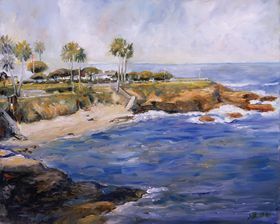 The seaside village of La Jolla, located just a few miles north of downtown San Diego, has been a favorite stomping ground for artist and tourist alike. A delightful village, La Jolla, which means "the jewel," is just that. A jewel that is most famous for its powerful and vivid seascapes, encompassing rocky cliffs and sweeping sandy beaches. When I first visited La Jolla some 15 years ago, I remember the lovely little town, a quaint village. Today, after living in La Jolla for over a decade, I never tire of its beauty. Many afternoons, I will venture out for a walk or hike. 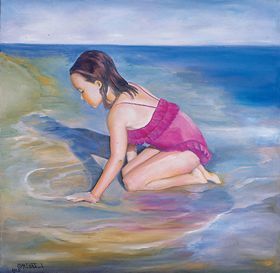 Most often, I stop to reflect or sit and paint the sea. On any given summer day you can see artists with their easels painting by the cove, sometimes with a print or two to sell. Most recently, I have been walking up Mount Soledad, a part of La Jolla often missed by the average tourist. It's a relatively short walk in distance, but takes a strong heart to make it up the winding Via Capri, which switches back and forth for about two miles. There are always bicyclists passing by, and the truly devoted joggers. I prefer to walk, but Mount Soledad is the ultimate challenge for athletes. At the top, you can stroll around the Mount Soledad Cross, a war memorial to our loyal soldiers that gave their life for their country. This serene setting has spectacular panoramic views of the city, from downtown San Diego to Coronado to Del Mar, and on a clear day, even Catalina Island. Another one of my favorite spots is along coast walk above the seven caves. I have spent many mornings walking along this path. You can reach this spot easily by walking northeast on Coast Boulevard from the Cove. Follow the ocean to the crest of the hill and you will see the Shell Cave; just to the left of the Cave store is the trailhead. While you're in front of the Cave store you might want to visit the Shell Cave. For a mere $2 you can enter the cave and venture down some 140 stairs to sea level. It's cold and damp, but at the bottom you will be pleasantly surprised as the cave opens up to a beautiful view of the ocean. Most recently, the seals have made their home along the rocks and are easy to view at this level. You might see a few hearty swimmers or an occasional kayaker looking for some adventure in the caves. And if you dare join the swimmers, you might even see some leopard sharks. Don't worry they won't harm you. Now, you have to climb back up the 140 plus stairs. Good luck! It is not so easy to climb back up through the cave, but it is still worth the $2 fee. After your cave adventure, it's time to begin your walk on the cliffs above the seven caves. There is another breathtaking view of the La Jolla Shores, Blacks Beach, Scripps Pier and Del Mar. A very short path, just 10 or 15 minute walk -- or longer if you take a minute to sit on a bench and enjoy the view. But there is a little secret on this path. When you get to the white wooden bridge, there is a hidden trail to the left of the bridge. This narrow trail will take you down to the rocky beach below. A rope is there to help you back up, as it is quite steep. Do this during low tide for the most interesting discoveries in the rocks, and you will also get a different prospective of the rugged coastline of La Jolla. From the white wooden bridge you can continue walking, but the path becomes a street, taking you to Torrey Pines Road. It is best to go back to the Shell Cave. You can do what I always do and stop at Gold Fish Point CafZ, just a few steps from the dave, for a cup of coffee.